Pills. Happiness. 1960’s LSD-fumed futuristic style… yes ma’am, that’s for me definitely. We Happy Few has been in development for years, some gameplay footage was out there but mainly everything else was behind curtain. My first impression of this piece was good and bad at the same time. Everything seemed to be very stylised and detailed. I was sucked in by the plot and it seemed exciting. What would go wrong? 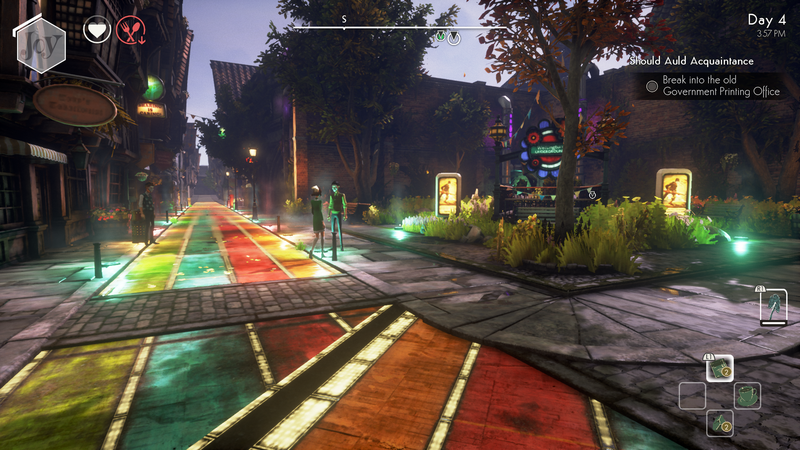 We Happy Few is about town’s people who take pills called Joy for their depression and to forget what really is going on around them. Also the past is manipulated by editing heavily everything negative out from old newspapers. That is also player’s job in the beginning to erase all bad news and when suddenly you have need of Joy but you also get some weird memories and you quickly realize that if you take Joy it’ll go away. I decided not to take the pill (if player takes the pill the game ends… really, it just ends) and see what happens. You’ll get to the realization that the Joy is bad and everything you see around you is fake. What really is there is foul, disgusting, moldy… for an example you think you’re eating candy but in reality it’s a dead mouse. That what Joy does to you. Other people notices very quickly that you are Downer (normal depressed human being) and they go after you and you have to run away. As you manage to get away from the pursuers you’ll start your adventure to get the hell out there. 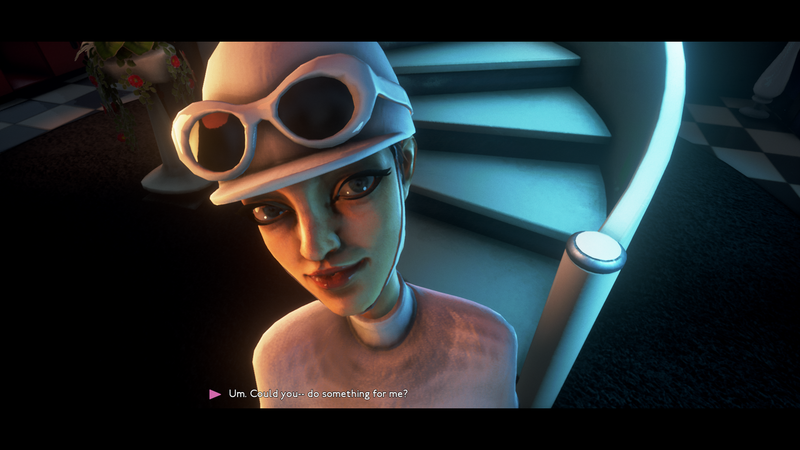 Gameplay in We Happy Few is basic first person adventurer where player has option to upgrade the character’s stats and skills and collect items and crafting weapons and healing items as well. What player also need to do is make sure your character get to sleep, drink water and eat enough. That is one of the most frustrating parts of the gameplay. It seems absolutely unnecessary to do these tasks and it doesn’t add anything to the gameplay except frustration. When you’re in the city, in the area where you need to take Joy or else EVERYONE runs after you and kills you, you only need to do a tiny little wrongness and it’s on. Really, I sometimes accidentally pressed running button like a millisecond and everyone started to scream and run after me demanding answers why did I run. It’s easy to run away from them, though, but it won’t end until you manage to hide or run out of the city area which both of them are difficult to do. It’s easier to let them just murder you. The people seem to be too easily triggered and there is mostly no way to correct your mistake. If you are low of Joy they’ll attack you as well, but too much Joy will take away your memories which I didn’t figure out what it does to the gameplay. The city is ridicilously full of people and these officers that are difficult to beat. They are randomized and usually I could see 7 officers in front of me at time. Badly scripted code. When you’re out of the city area it’s also easy to get killed by those ones who don’t use Joy. You only need to have a wrong outfit and that’s all. Bugs, glitches, errors, whatever you wanna call them, was presented mostly. I learned to use some bugs for my advantage to get through some parts of the game which otherwise was very difficult. You know, I could go on with the list of everything that’s wrong with the gameplay but I won’t. The gameplay was the reason I rage quit the game and deleted it. Controls, though, are OK, not to mention the horrible fighting scheme. You can use your bare hands or crafted weapons but dear lordnessa if you accidentally press a button that takes out your weapon in a city!! 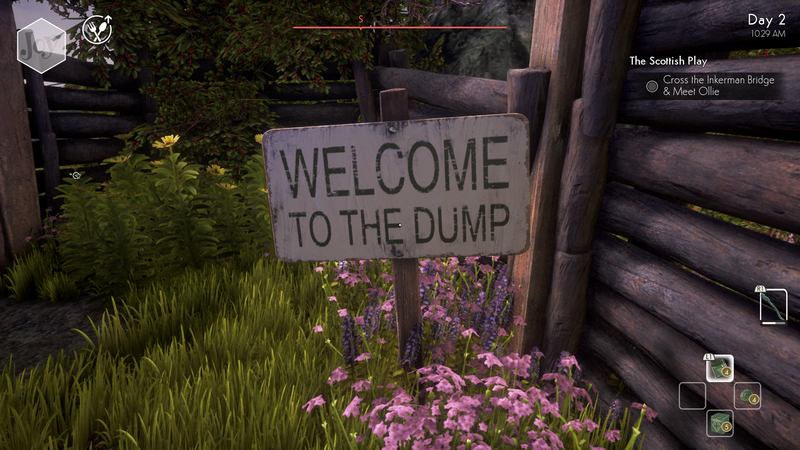 I have to say that We Happy Few is absolutely detailed game. This is how details should be in every game. If I went in a house I could easily read letters that was lying on the table or stuff in a bulledboard or writings on a blackboard. Everything was so detail oriented. But if I have to pick something the graphics was not that pretty and the game had technical difficulties at times. We Happy Few was full of 1950-60’s music and sounds. It was lovely at the beginning but became annoying to listen the same things over and over again. I didn’t come up with technical issues with the sound. 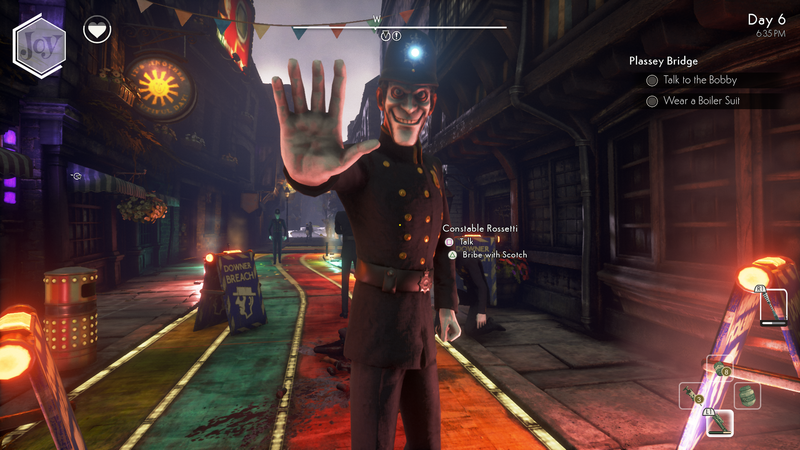 OK, here’s the deal, We Happy Few is annoying game. I played as ‘Normal’ and didn’t find it to be overly difficult. I died a lot but it was mostly because of the gameplay. Many times I had no idea where to go, what to do and the last thing was that I needed to find an item X to craft something and I realized that I need to search it literally from everywhere and I was in a city and I tried to go inside peoples houses but just got myself killed. The city area was huge and I couldn’t run so I had to walk a long way out of the city and then search it from other places until it randomly comes up when I realize I wanna just give up. We Happy Few is full of annoyances, super horrible gameplay designs, bugs, glitches and it makes the it more difficult than it should be. Sometimes less is more but We Happy Few should take at least 5 things off before heading out. We Happy Few is heavily unfinished. I have become to a realization that almost every new game is unfinished when they come out. That is the way for developer to collect the coins to continue developing the game and 6 months to a year it’s then ready with huge patches. This is how video game world works nowdays and be awared when you buy new games. We Happy Few is one of them and it cost me 60€ (68$) to experience this. I think I want my money back. Or at least couple Joy pills. I remember seeing this game a good while ago…the concept was interesting but the art style was a bit off-putting to me. Stylistically it reminds me, a little, of Bioshock. Sadly, but not shockingly, it falls short. I got the Bioshock vibe too. But honestly, this is bad game at this state.